Better habits means better breathing, and better breathing means a healthier life! Highly Effective Physical Therapy Exercises to Improve Breathing, Bite, and Orofacial Posture. The interaction between orofacial structural growth and muscle activity starts early in development, and the physiologic functions of suction, mastication, swallowing and nasal breathing in infancy play an important role in stimulating subsequent growth. The habits we develop in our youth inevitably translate to behaviors later in life. By training the muscles in the face to act in their optimal biological way, muscle memory can keep the teeth and jaw in alignment as we grow and develop. (In many cases eliminating the need for future orthodontics). Orofacial Myofunctional Disorders (OMDs) affect the functions and muscles of the mouth and face. OMDs can cause a variety of effects either directly or indirectly. From problems breastfeeding, stunted facial skeletal growth and development, disordered chewing, swallowing, speech impediments, malocclusion, temporomandibular joint movement/disorders, poor oral hygiene, stability of orthodontic treatment, facial esthetics, and more.Many people mouth-breathe more than they should. As a result, the muscles and the orofacial functions tend to adapt to a disordered breathing pattern, which in turn creates many OMDs. Myofunctional therapy can help enable one to enjoy eating, speaking, breathing, and even sleeping more soundly. Not to mention that the Cosmetic benefits can bolster self-esteem. To better understand the importance of proper tongue position (roof of the mouth)/proper oral rest posture. ​A low tongue position can contribute to improper muscle functioning and can lead to airway obstruction. To better understand the importance of establishing lip seal. To clearly identify and illustrate the importance of pre/post operative Myofunctional therapy exercises in a clinical setting and as part of a successful tongue-tie (Frenuloplasty) procedure. To help strengthen the tongue and orofacial muscles through myofunctional therapy exercises and pattern retraining to help resolve issues associated with sleep, breathing, posture, orthodontic relapse, cervical neck tension, and jaw pain, among others. ​Therapeutic exercises will help the strength and range of motion for your jaw, cheeks, lip and tongue. People with trouble speaking clearly, swallowing problems, or muscle weakness of the mouth may benefit from these exercises. Orofacial myofunctional therapy is also appropriate for adults. In many instances, a myofunctional disorder develops in response to late jaw growth, worsening of a malocclusion over time, or other reasons such as tooth loss. Therapy for adult patients is typically efficient. Adults of all ages are capable of achieving success in treatment. 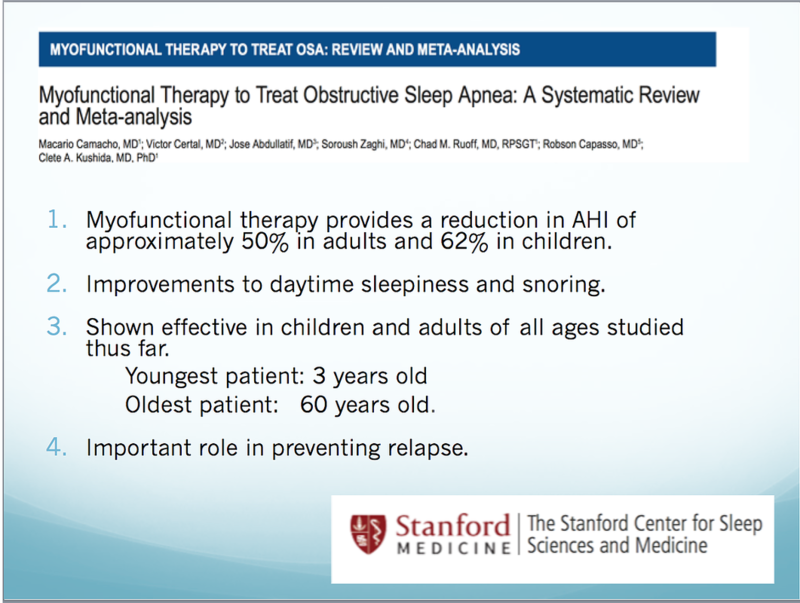 Myofunctional therapy may be an attractive alternative treatment for sleep apnea. It is non-invasive, inexpensive, and has no major risks. For example, you may be able to avoid the use of continuous positive airway pressure (CPAP) or even surgery. In addition, the therapy has been used in other conditions. Mouth breathing can completely alter how your child looks which is the skeletal development of a child, and completely disrupts airway development which affects the amount of oxygen the body requires for proper function. We know that mouth breathing affects the resting position of the facial and tongue muscles, often mouth breathers experience a wide variety of signs and symptoms from early development to later in life consequences. Sadly, failure to nasal breath affects your overall health. Mouth breathing affects the levels of oxygen and carbon dioxide that are in the body. Our bodies rely on a specific amount of incoming oxygen and outgoing carbon dioxide to remain in a healthy state. A low tongue rest position (or posture) is either a necessity or a habit. A low tongue position can contribute to improper muscle functioning and can lead to airway obstruction. Any time the nasal breathing is impaired, temporarily or chronically, the jaw drops and the tongue positions itself low and forward to open up the upper airways. A low tongue rest posture habit can be lasting even if the causative factors are corrected ie. Tongue tie has been released or nasal breathing has been established. Myofunctional therapy can help correct the tongue resting position - creating better habits for better health. Lack of nasal breathing or sleep disordered breathing may lead to the tongue moving or resting forward and pushing against the teeth (static). During the swallow, instead of pushing up to the palate the tongue moves forward or laterally, called anterior, bi-lateral, unilateral or bi-maxillary tongue thrust (dynamic). In children, establishing this good resting tongue posture is critical for good facial growth and airway development. ​​Current literature demonstrates that myofunctional therapy decreases apnea-hypopnea index by approximately 50% in adults and 62% in children. Lowest oxygen saturations, snoring, and sleepiness outcomes improve in adults. ​Myofunctional therapy, functional evaluation of tongue mobility as related to sleep disorders. Disorders of the muscles and functions of the face and mouth. OMD's may affect facial skeletal growth and development, chewing, swallowing, speech production, occlusion, temporomandibular joint disorder (TMD), stability of orthodontic treatment, facial esthetics and much more. The purpose of myofunctional therapy is to retrain the muscles and to obtain a normal resting posture of the tongue, lips and jaw. The approach to therapy emphasizes training in the correct resting postures of the tongue and lips all with the goal of facilitation proper nasal/diaphragm breathing. The nose’s primary function is inhaling oxygen, followed by filtering air, warming, and moisturizing it- this allows our body to get more usable oxygen which can have a profound impact on the growth and development nose’s primary function is inhaling oxygen, followed by filtering air, warming, and moisturizing it- this allows our body to get more usable oxygen which can have a profound impact on the growth and development of the face and airway.